Those of you who know me are immediately thinking, “Julianna made this cake? ?” Well, you’re right! I did not make it! I can only lay claim to having photographed it and promptly devouring it! Today, I am celebrating my friend Mandy’s talent. She has the patience and artistic ability to create a masterpiece like this, and I was so lucky that she gifted one to me. Placing all of those tiny almond slices so precisely? She claims that it reduces her stress levels – go figure. Those of us who don’t bake are just cringing at the detail work it takes to make a cake like this, but Mandy found it meditative. These rich, mouthwatering cakes make the perfect finish to any festive meal. 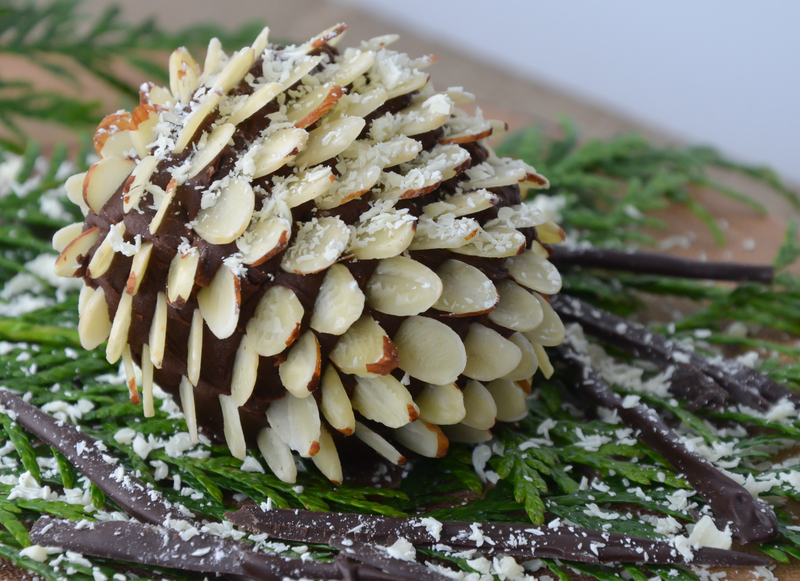 I suggest that you gather some cedar boughs like I did; place them on a cake plate and grace the boughs with these sweet little pinecones. Dust with some grated white chocolate and shaved chocolate bark, and you will have the most drool-worthy centrepiece ever. Here’s to you Mandy! I will be bringing a lovely big plate of pinecone cakes over to my buddies at Fiesta Friday. I hope that everyone enjoys them! Our host, Angie of The Novice Gardener, and a plethora of welcoming co-hosts have been opening their doors to us for 45 weeks now and we are still banging down the doors to get in! Please be sure to join us, if you haven’t already! This recipe originally comes from Martha Stewart Living magazine. Difficulty: You must be very patient! Preheat oven to 350°. Butter a 10-inch round cake pan. Line bottom with parchment paper, and set aside. Spread almonds in a single layer on a rimmed baking sheet; toast in oven, tossing occasionally, until light golden and fragrant, 7 to 10 minutes. Let cool. Place the toasted almonds and ¾ cup sugar in a food processor, and pulse until the mixture is finely ground. Transfer to a bowl, and stir in flour; set aside. Melt butter in a small saucepan; remove from heat, and stir in rum and vanilla. Let cool slightly. With an electric beater, beat the egg whites with salt until soft peaks form. Gradually beat in the remaining ¾ cups sugar, beating to stiff glossy peaks. Fold the flour mixture into the egg-white mixture in three batches, alternating with the butter mixture and ending with the flour mixture. Pour into prepared pan. Smooth the top, and bake until the cake is golden brown and firm to the touch, about 40 minutes. Let cake cool in pan 20 minutes on a wire rack. Turn out cake onto a wire rack, and let cool, top-side up. Using a 3-inch oval cookie cutter, cut eight ovals from cake. Discard scraps. 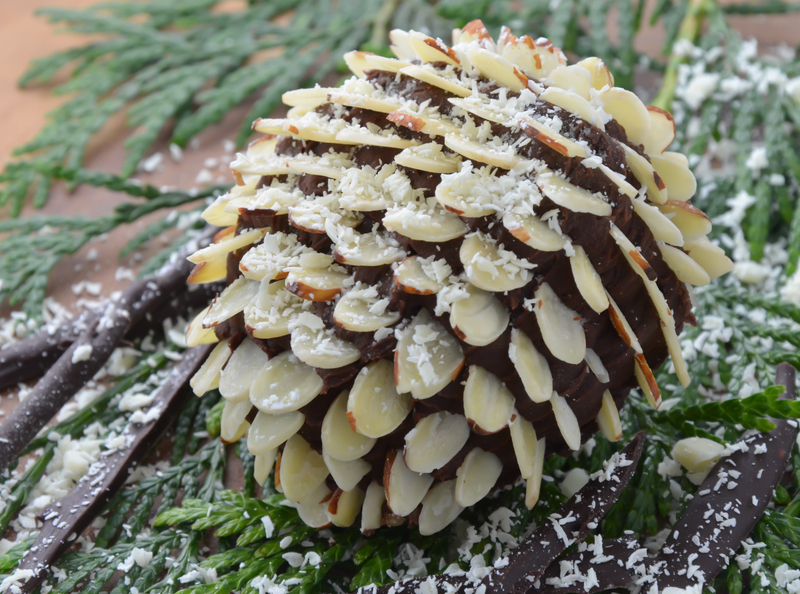 Trim each to resemble a pinecone with a rounded base and a pointed tip. 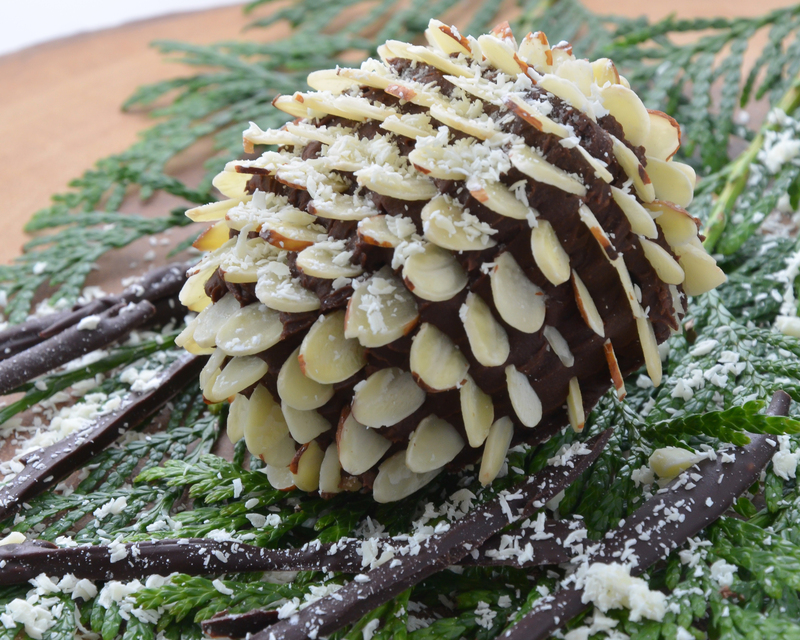 Leaving the bottom unfrosted, spread about 1/3 cup frosting on each pinecone; smooth and round to create a three-dimensional shape. At the base of one cake, arrange sliced almonds in a spiral, overlapping slightly. Continue arranging almonds in closely set rows to cover the entire surface. Transfer finished cake to a baking sheet in the refrigerator to set while repeating process with the remaining cakes. Just before serving dust cakes with confectioner’s sugar or finely grated white chocolate and garnish with chocolate shavings, if desired. In a medium bowl, sift sugar and cocoa powder. Whisk in butter, milk and vanilla until smooth. If not using immediately, refrigerate, covered, up to 3 days. Bring to room temperature before using. Note: These cakes freeze nicely. I kept mine in a cookie tin lined with waxed paper for several months before eating it. These would make such a wonderful Christmas gift! I had admired this cake from our friedn Martha and turned the page very quickly knowing I would NEVER attempt it! Even if I performed surgery on a millimeter scale for 20 years, I would not have the patience Mandy had to create this masterpiece. Plus Martha has STAFF who do this! Kudos to Mandy. I’d gladly accept a delivery! A true labor of love. You must be a good friend! Simply stunning and so so representative of the season! Your friend is extremely talented!! What a great centre piece for the Christmas table! Yum!! Tell Mandy she’s bonkers… I love this! I’m passing your message on to her, Melissa! She will agree with you, I think! Yes, my first thought WAS ‘did Julianna make that?’ But only because its amazing!!! And the fact that any human made it, is amazing, wow! I love it!! 🙂 I reckon I would, maybe one day I should give it a go…?! Awesome idea – they actually made me double take! hahahahaha you did all the fun part… the photos and eating it 😀 perfect!! Oh my god that’s amazing. Oh, you are just too kind! wow, this is so cool! What a great idea! Gorgeous is a small world for this cake chef! Absolutely divine. Wow, that cake is amazing! Your friend is very talented. I sometimes find things like this incredibly therapeutic, other times I find them very stressful though – I guess it depends on my mood! Baking in general is very calming for me though. I’m so glad you and Mandy are sharing these with us at Fiesta Friday, we’re very lucky!! I’m gonna scroll back up and stare at them a little bit longer now…. These look amazing! I had seen a similar cake in BHG magazine last year and was never that courageous to try it but your friend did an amazing job! This cake would easily be the centerpiece for a Xmas party! Hey Indu! This is just the kind of recipe that BHG would showcase, and I can’t blame them. I’ll pass on your comments to Mandy! Have a great week! I love the “You must be very patient” line in the recipe. I think I’ll give this one a miss although it really is such a beautiful idea. And your photographs are wonderful. You did justice to Mandy’s cake! It’s amazing! You’re not only a great cook, you are a great artist as well! Hope you had a great Xmas eve, Julianna!